You can easily stop recording a call, depending on how the call is made. During a web conference, the organizer can stop recording by clicking the icon in the left toolbar. Once stopped, recording cannot yet be resumed. Using the dialer, you can stop recording by clicking the icon below. 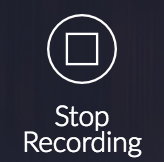 Once stopped, recording cannot yet be resumed.